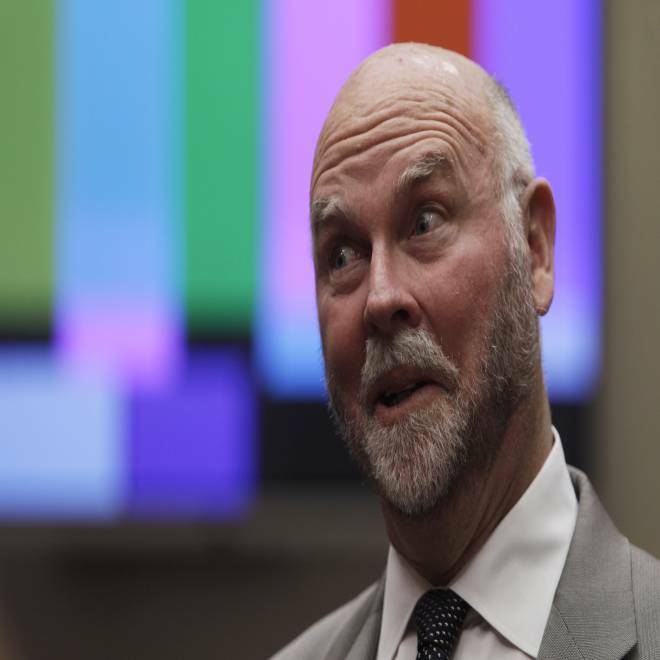 Genomics pioneer Craig Venter, seen here during a congressional hearing in 2010, says his team is working on a system to convert genetic code into a digital file that could be sent via email. Someday, genetic code may be as downloadable and potentially shareable as email, thanks to devices that can translate biological material into digital files, and vice versa. That's the vision that J. Craig Venter, a pioneer in the field of synthetic biology, laid out last week at Trinity College Dublin as part of Euroscience Open Forum 2012. Venter's talk — titled "What Is Life?" — was intended as a follow up on physicist Erwin Schrödinger's 1943 lecture in Dublin on the same topic. That earlier lecture was seen as foreshadowing the age of genetics and the discovery of DNA's double-helix structure a decade later. Venter's talk sketched out a 21st-century vision in which the code of life is seen as merely another kind of software. "All living cells that we know of on this planet are 'DNA software'-driven biological machines comprised of hundreds of thousands of protein robots, coded for by the DNA, that carry out precise functions," New Scientist quoted Venter as saying. "We are now using computer software to design new DNA software." Venter said he and his colleagues are now designing the software for three different types of microbial organisms. Once the digital designs are finished, they'll be fed into DNA sequencing machines to create the corresponding chemical code. The genetic software would then be inserted into hollowed-out cells to kick-start the machinery of life. "I am hoping it will happen this year," the Irish Times quoted Venter as saying. His aim is to produce microbes that are custom-designed create biofuel, foodstuffs or pharmaceuticals. Using today's technology, researchers can collaborate on genetic design by converting the four-base code of a DNA molecule into a standardized digital file and then sending the file to another lab, where it's converting back into DNA molecules. Venter talked of developing a miniaturized digital-biological converter that could do the trick, Forbes India reported. The concept could lead to technologies that streamline the creation of synthetic organisms, just as 3-D printers are streamlining the creation of synthetic shapes. "This is biology moving at the speed of light," Venter said. Can policymakers keep pace? A progress report from the Synthetic Biology Project at the Woodrow Wilson International Center for Scholars suggests that's debatable. Today the project updated its "Synthetic Biology Scorecard," saying that federal agencies have started taking steps to address a set of policy recommendations issued 18 months ago — but haven't yet fully addressed any of those recommendations. On the plus side, federal officials have set up an interagency working group on synthetic biology, have participated in international meetings on the issues surrounding synthetic biology, and have drawn up a National Bioeconomy Blueprint. But the project says there's been no federal activity to review public funding for synthetic biology research, assess the risks associated with releasing synthetic organisms outside the lab, or evaluate moral objections to the technology. Will synthetic biology open the door to a brave new world? An ethical and environmental morass? Both, or neither? Feel free to weigh in with your comments below. What is to be done about synthetic life?